This lesson provides a technical introduction to Global Navigation Satellite Systems (GNSS), covering theory, procedures, and accuracy issues. Aimed at professionals in a “geospatial science” field, including engineers, surveyors, meteorologists, geographers and GIS professionals, it will also be useful for emergency managers, and technically-inclined members of the general public with appropriate math and/or science background. For those who may currently see GPS/GNSS as a “black box”, this 1.5 hour lesson provides an understanding of the underlying principles and concepts to support correctly interpreting GPS results and obtaining accurate measurements under various circumstances. Was a very thorough and in depth exploration of GNSS. Enjoyed the course, it gave me a much better understanding of the data that I am trying to work with. Muy buen material, me gustar que lo generaran en espal para una mejor comprensi y que se incluyeran mas ejemplos. This lesson is a very good overview of what users of GNSS mapping equipment should understand so that they get decent data. Units are well-organized, explanations are clear, and there are links to reference material/appendices that are really helpful.The NGS/NOAA material is a terrific resource. Very informative, I will admit that i found this to be the hardest of the lessons that i have taken. I really enjoyed the challenge. A little deeper explanation of material, perhaps some anecdotal examples that go from rudimentary to advanced in their complexity, that way a learner can absorb as much as they can comprehend. The later sections more technical about geodesy were of limited usefulness for my field of work (meteorology) yet very instructive. A good overall review of the subject. While I find the course material sound, the web quiz was confusing. In general, the material is too heavily slanted to the survey community and could be generalized for the larger GPS community. In addition, the material contains some factual errors (like stating that GPS is on the ITRF, when it is on the WGS 84). But overall, a useful lesson. I really appreciate the outside links you provide in context, where additional information can be found. This lesson contains several good visualisations helpful for GNSS education. On the other hand, there are also several inconsistencies. I point out below few I spotted:section 2f: The statement "With three satellites in view, the receiver should be able to figure out where it is in three dimensions (lat/long/height) on the surface of Earth" is incorrect. 3 sats give us 2D pos (lat/lon) + rx clksection 5b:The formula for the radius curvature in the prime vertical is completely erroneous. appendix2:Partial derivates for the pseudorange should take the squareroot to denominator. Also, I believe there should be minus sign. There is subscript inconsistency for ∆P on the left part of the matrix form. Good - quite concentrated but straightforward explanation. More equations available in appendices for those who want them. This lesson contains a lot of good information but it is not broken down in an sort of easily absorbable way. This lesson is very informative in a technical fashion that might make it difficult for people with little to no prior knowledge to manage. I like this new format and the quizzes really make you think. This material is something that everyone insurveying needs to know and learn. Pretty good crash course on GNSS. Covers a lot of complex material in a very short period. The quiz format with multiple correct answers is tough thought! I had to read the material a number of times to be sure I understood. There are area which could be a little more in depth and a few terms that need to be better defined. There is a mathematical error on Unit 3 question 3. -- 0.579 cycles at .19 m/ cycle is 11 cm.not 13.1 cm. Unit 3 question 4 the 'correct' answer gives 1Ghz as 1x109 instead of 10 to the 9th power. Overall: Explain professional tools and methods, as well as underlying concepts of global navigation satellite systems (GNSS) and how they are used to achieve accurate and precise horizontal and vertical positioning results. Identify the key components of a GNSS system and the function of each. Explain the principles of trilateration as used in GNSS-enabled positioning. Explain how the receiver determines the identity and location of each satellite using the navigation message and signal-matching. Explain the process for estimating pseudorange using PRN code synchronization. Describe how estimated position is calculated using pseudoranges. Describe how wavelengths are used for precise distance measurement. Describe the use of phase measurement and counting cycles to obtain precise distance measurement to the satellite. Explain how post-processing services such as NOAA’s OPUS are used to increase accuracy and reduce positioning error. Explain how increased observation time increases the accuracy of GNSS-derived position. Explain how the mathematical process of of double differencing is used to increase accuracy and reduce errors. 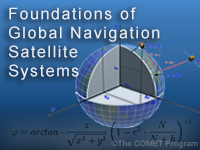 Explain the role of continuous GNSS active-relative positioning systems such as NOAA’s CORS. Describe a reference frame (or datum) and how it is used in GNSS. Describe the process of converting between Cartesian coordinates (X,Y,Z) and positions (latitude, longitude, ellipsoid height). Explain why, for most applications, heights should be converted from an ellipsoidal to an orthometric reference frame.